On a scale of 1 to 10, Mugshots blew. Tuscaloosa sunk to a new low. Here is the thing: there is only so much hype, creativity, and atmosphere that can cover up lousy food. Once you get over the hype, realize that it really isn't that creative, and the atmosphere is proven to be artificial, you can really tell what the food is worth. In Mugshot's case, the truth hurts. Eusebio and I had to drive through Tuscaloosa, AL on our way home from Talladega and thought it may be a good idea to stop for dinner at a highly rated Crimson Tide joint. 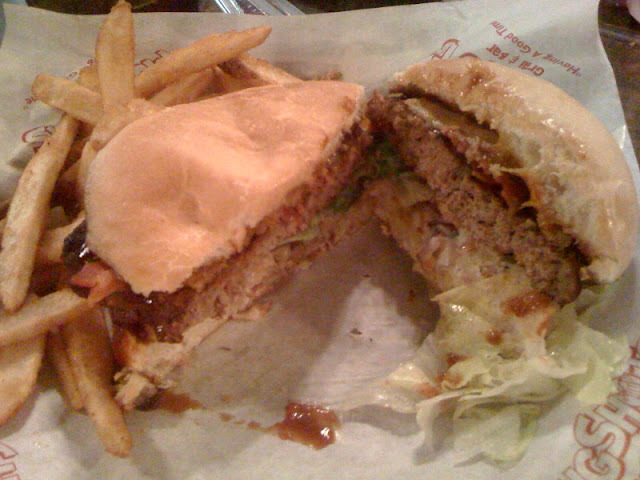 Mugshots Grill and Bar is right off of the University of Alabama campus and promoted their intesteresting array of specialty burgers with different combinations such as "Trevor's 1000 Island Burger" and "Stu's Magic Mushroom Burger." They say "These burgers are said to be the best around - a full half pound of choice ground round, grilled medium-well..." What kind of self-respecting burger joint cooks all of their burgers medium well? I figured out the answer: the kind that uses frozen patties, a.k.a. Bubba Burgers, and tries to pass them off as something close to gourmet. To make matters worse, we also ordered an interesting appetizer that didn't really tickle our taste buds. Fried rib tips sounds pretty good. I like ribs, and I like most things fried, so I thought it would be hard to go wrong. Well, I missed the call on that one! The rib tips were over battered to the point where the actual rib did not stand out. 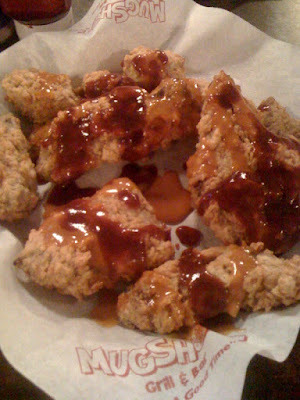 It was like eating battered batter with a hint of rib meat. They had potential, but were not well executed. However, the biggest sin of it all is that they clearly battered the rib tips in the same batch of batter as the fried pickles. Mixed into our basket of fried pork was a stray fried pickle which almost made me throw up a little in my mouth when I accidently inserted it into my pie hole and chewed. There was clearly pickle juice mixed into the batter as well because each rib tip had a slight hint of pickle taste... and if you know me, you know how much I hate pickles. They are my arch rival. I hate pickles like I hate Nick Satan... I mean Saban. Around the bowl and down the hole, roll tide roll! Before I knew any better, I placed an order for the McDonald Burger which the menu claims is by far the best burger that they offer. Apparently the best they offer is previously frozen, over cooked crap. It was later confirmed by watching a member of the kitchen staff walk out of the freezer with a box of Bubba Burgers that Mugshots really is that bad. While I'm not trying to knock Bubba Burgers since they are a good choice when in the market for a mass produced, sizeable, uniform, frozen buger patty, I am willing to say that any restaurant that uses the product should be shut down or just simply be called fast food. I don't understand how a restaurant that prides itself on burgers can continuously use frozen patties and pass it off and something good in the community. The eaters of Tuscaloosa that actually like this place are worse than people in Baton Rouge that actually think Walk On's has good food, but that is a story for another day. The burger contained a dried out beef disc with ranch and barbeque sauce, bacon, lettuce, tomoto, and red onion. The taste of the bun and condiments actually made the burger edible, but certainly not anything to rave about. The highlights of the night were easily the sweet tea and the beer battered fries which I think I can actually say were pretty good! Make sure you read Eusebio's review for his take on Anthony's Peanut Butter Burger and Mugshots as a whole. Needless to say, he won't be going back either. Wow! Bubba burgers?! Dirty bastards!! Reading this, I just realized that you really don't do many negative reviews, so this place must not be so great. i can agree. if you ever make it near tuscaloosa again, try oasis in cottondale. hole in the wall but good burgers. Agreed Jay. I'm from Tuscaloosa and embarassed by the place. They maintain a crowd somehow though. Last time I went will remain the last time I went. The scummy sink was so dirty in the Men's room that I'm sure it hasn't been properly cleaned since the day they opened. Our food took almost an hour and without apology or explanation after it was delivered the only time we saw the waitress again was when she blurted while in motion to another table, "Oh...your meal is comped." I can only assume she saw the disgust on our faces. Once our long awaited meal arrived, I do think my McDonald burger may have been better than yours, but not stellar. The Magic Mushroom burger was charred to a crisp on one side and raw on the other. Unless you want to be infuriated with neglectful restauranteurship and complet idiocy, avoid this place. It is ashame to because it could be a great building and great place. The location is very good. But you'd be better off looking for something on a side street. Jay, you are the single worst food journalist I've ever read. I can't imagine how Google fu*ked up enough to put your hor$e$hit in my search results; it's pathetic. Learn how to eat, then move on to typing, then consider English. Try not to tarnish the good name NASCAR has fought for in Alabama, please? "...neglectful restAURANTeurship"??? Anybody out there in Racecar Expert-writer-land own a DICTIONARY? 2) You must not read much. However, even if I am the "worst food journalist" you've ever read, I still thank you for reading. 3) I know how to eat quite well. If you read more of this blog, you'll see that I eat a lot. But I still don't enjoy frozen burger patties. And I can type, as evidenced by my long-running blog here. This post was written nearly 2 years ago, and I have learned a lot in that time, but I still stand by my writing. And I have no clue what I wrote that's not in English. I know Spanish too though. Would that help? 4) I'm a fan of NASCAR. The race at Talladega was great. When did I do anything to tarnish that? 5) If you'll notice, "neglectful restauranteurship" is a comment from another reader, not my writing. I'm not sure why it pissed you off so much, but the person who wrote that is from Alabama and seemed to agree with my assessment of Mugshots. But don't call me out for something that I did not write! 6) Yes, I am a dork. At times. Better than a troll. Jay, I can tell you as a former employee of Mugshots, that everything you said is sadly true. The burgers are indeed frozen and arrive to the store in cases of 40 frozen "discs". The rib tips were so bad that they were taken off the menu months ago. Sure, the burgers are decent, but so are the ones that come off of the grill in my back yard. For $8, i'd go to Wendy's and get 3 for the same price.